I am not 100% sure what the Cylinders are, reed valve 347cc TZ700? That said wheels look to be Morris but as they not painted they will likely be un-serviceable. So what do you reckon the swingarm is I never noticed the round top tube, looks mabye TS125ER with a bit welded on top. The yokes are not anything TZ from 1976 onwards. had enough of those in my hands over the years. The lower is alloy and 35mm through to 1980 when they went to 36mm legs (but tapered to 35mm at the top). 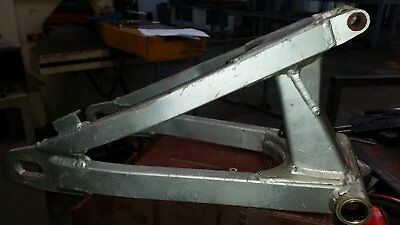 This is a 250F/G or 350F/G/H swing arm. Okay the RDs were 34mm A/B then 35mm the last 400 Daytona might have been thicker again they then thinned them on the LC. The yamaha twins book i have has the TZ growing nearly every 2 years. That said i have found some stuff wring in the twins book some of the suff like the chassis and the gear ratios they mention as only being on 400's were on the 250's as well. Some have said they used to use the Steel Early caliper on the TZs as they were stronger and flexed less the Early TZ750 looked Steel though. Pretty sure as long as its like for like 2 piston opposed A/B RD they bolt on to the TZ as the forks mounting were higher onthe TZ forks? RD C models on were silly slider calipers i actually think the are not even R and L handed or different front to rear. C-E 76-78 TZ250/350 plus A-C 74-76 TZ750 had cast iron calipers identical to the RD two piston ones. People reckon there's a slight variation in a casting mark, but nothing really. 79-80 TZ250/350 F-G and D model / 77 onwards TZ750's had the alloy ribbed calipers (plus also the TZ125G). They flexed and many riders took them off. Even Roberts did on his works 500 used the same RD style cast iron ones in 78! In 1981 with the new Powervalve TZ250H, they reverted to the cast iron black caliper and then in about 83 a new works style allow two piston caliper also found on the TZ500J. All these calipers are interchangeable with each other. Yes, the caliper mounts are higher on the TZ's than the RD's as these all used 298mm discs. Non of the TZ's ever used a sliding pin caliper. McKellars Factory road racer Yamaha book is full of inaccuracies, which have been repeated as fact for many years. E.g, TZ750C model (1976) he quotes 40 being made with the first one as 409-100101 frame / engine number. Mine was higher than 409-100160 (in fact the highest serial for that year that any one has ever seen)and I know others which were higher than 409-100141 that he would have you believe was the highest. My Mckellars one is just the Twins one. HOLD THE PHONE! I have the alltime winner! Out of Utah, united state of amazement! Ha, but yeah it's just way to advertise he has all parts. Just needs a few nuts & bolts to get it running. . . .. Oh, maybe a few other things. And no, it's not $200. if you have a close look it has a link to all the parts they have for the machine, on trade me often you get a bike and 'auction is for one bolt' scenrio, ebay have stomped on this.
" would suit someone who has the time . . . "
What was Sean Connery's character in Highlander? He'd probably have the time. Oh boy instead of working on my fake classic I should let it sit in my garage and appreciate, which apparently it already has!! All times are GMT +12. The time now is 06:22.